John and I spent a lovely afternoon on Walnut and Fourth Streets at The Kirkwood Hotel in downtown Des Moines today, visiting with Iowa artisans at Market Day Iowa, a curated pop-up market. Market Day is held in the hotel lobby, ball room, and bar on the ground floor. 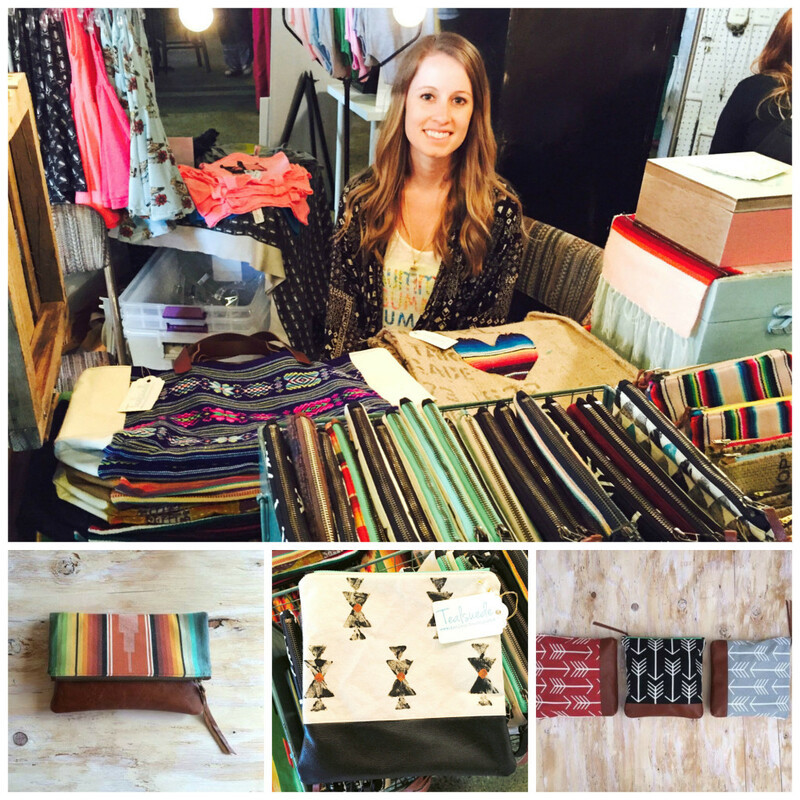 The vibe is young and trendy, with many highly skilled artisans displaying their wares. 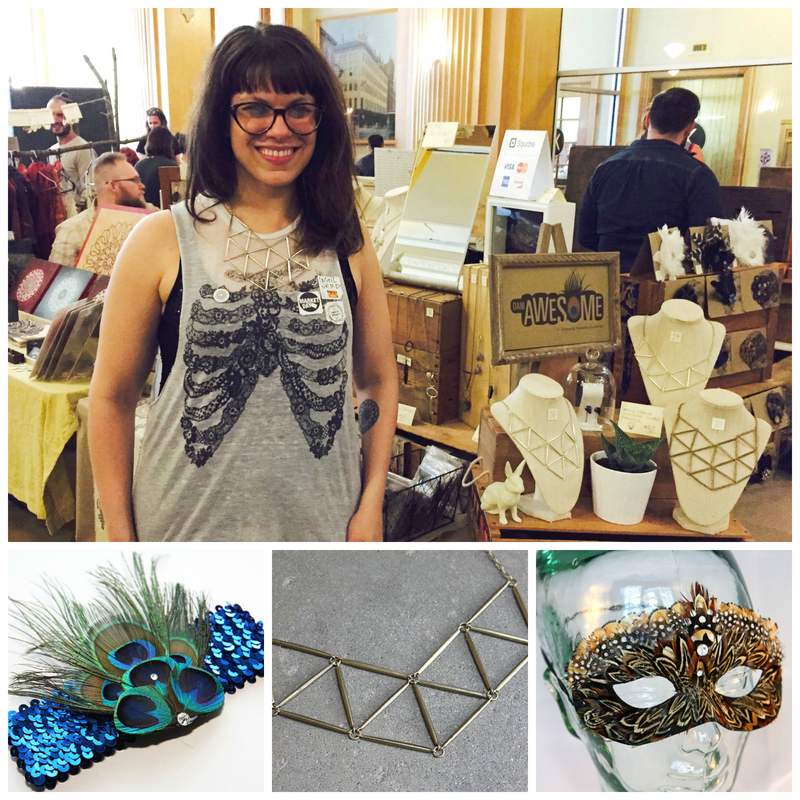 I met Dani Ausen of daniAWESOME, who organizes the Market Day events that have been showcasing Iowa artists, crafters and vintage sellers since 2009. When she is not coordinating Market Day, Dani is a maker herself who sells hair fascinators, jewelry and masks in her Etsy shop. In this post I’d like to introduce you to some of the most interesting artisans I met. I chatted with Liz Brooks of Teal Suede, who marries together colorful fabrics and buttery-soft leather to make handbags. She also paints designs on some of her fabrics. 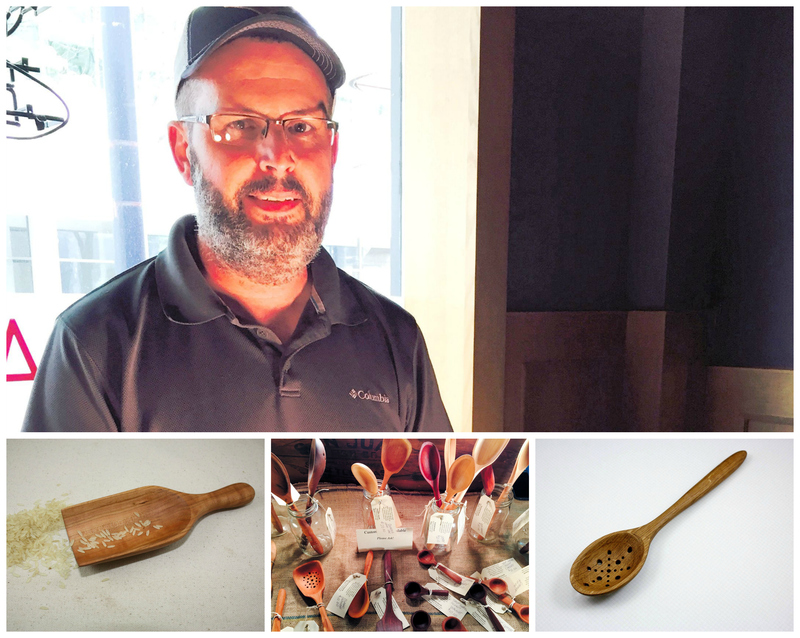 Jason Headlee of Blue Prairie Kitchenware uses hand gouges and rasps to make beautiful wooden spoons, spatulas, spreaders, coffee scoops, and other kitchen implements from oak, cherry, walnut, osage and other woods. No two items are alike; these are truly keepsake tools. You can reach Jason by email at jheadlee1@gmail.com or call him at 515-975-3282. 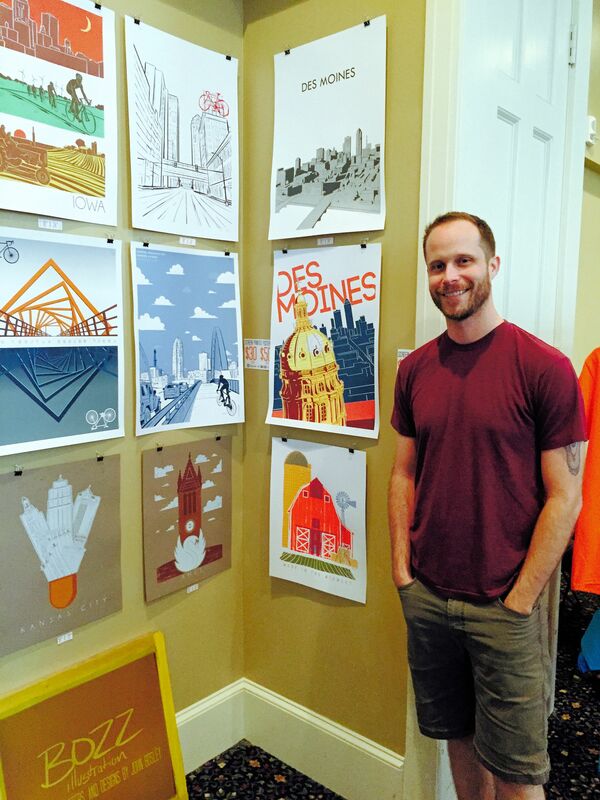 John Bosley of Bozz Illustration designs art prints, posters and other graphic works that feature Des Moines landmarks and Iowa culture. His screen printing studio takes up most of his basement. 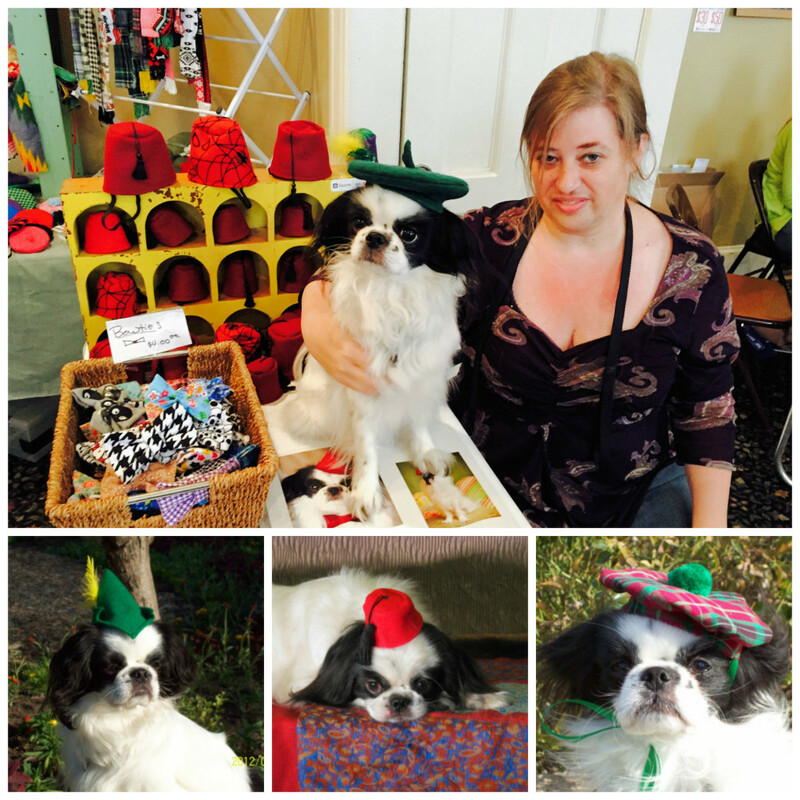 Veronica Deitrick of Dog in a Fez makes adorable dog berets, fez caps and other dog wearables. Her model and her inspiration is her Japanese Chin, Fuku Wanwan. Because her Web site is being revamped at the moment, she urges you to contact her via the Dogs of Des Moines site or by email at vldeitrick@gmail.com. 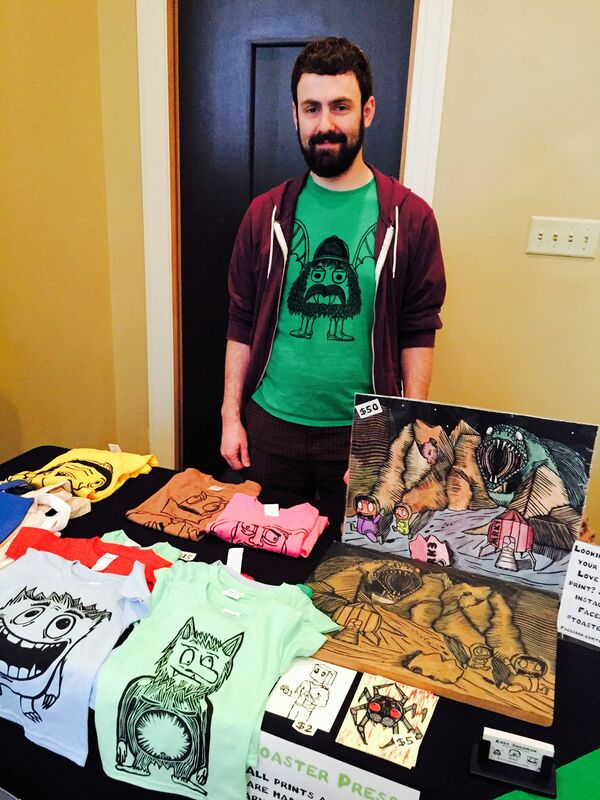 Cody Sherman of ToasterPress is a woodcut printmaker who transfers his drawings to a woodcut, which he then inks up to print T-shirts you’ll find nowhere else. His style is both humorous and whimsical, and the inked woodcuts themselves are works of art. 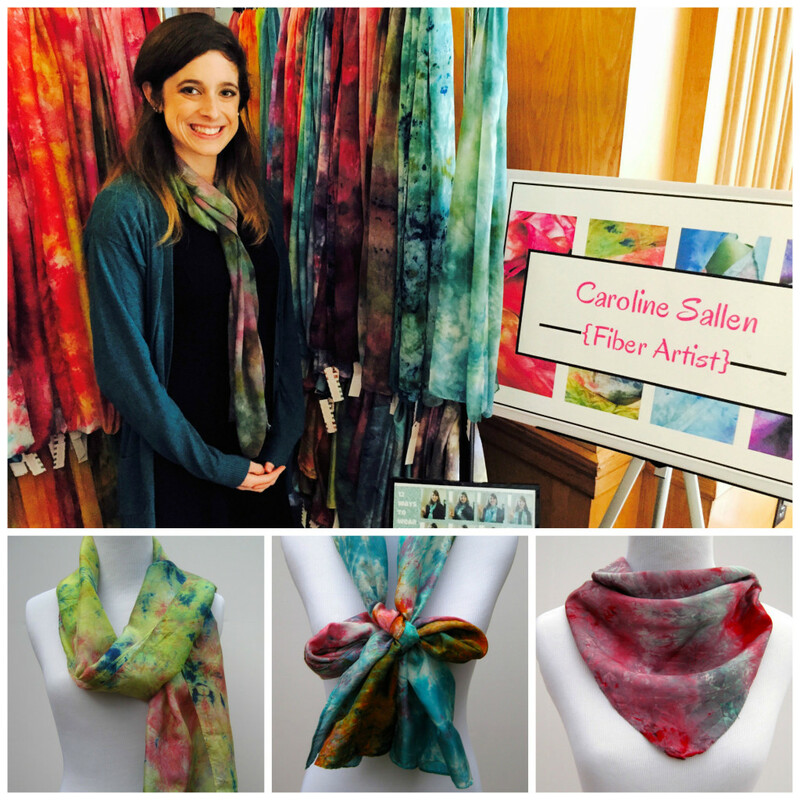 Caroline Sallen is a fiber artist who dyes silk scarves in a rainbow of colors. You’ll find her shop on Etsy at Caroline Sallen. I bought a silk scarf from Caroline, and loved the fact that she enclosed a photo showing 12 different ways you can tie a scarf. During the daytime, she is a special education teacher, but in her spare time she not only dyes silk scarves, but she also designs art quilts. You can find examples of her work on her Facebook page, Caroline Sallen Art Quilts. Sabrina Alery, a stay-at-home mom who owns The Honor Roll, designs what she calls “pretty cloth and paper” planners and stationery. 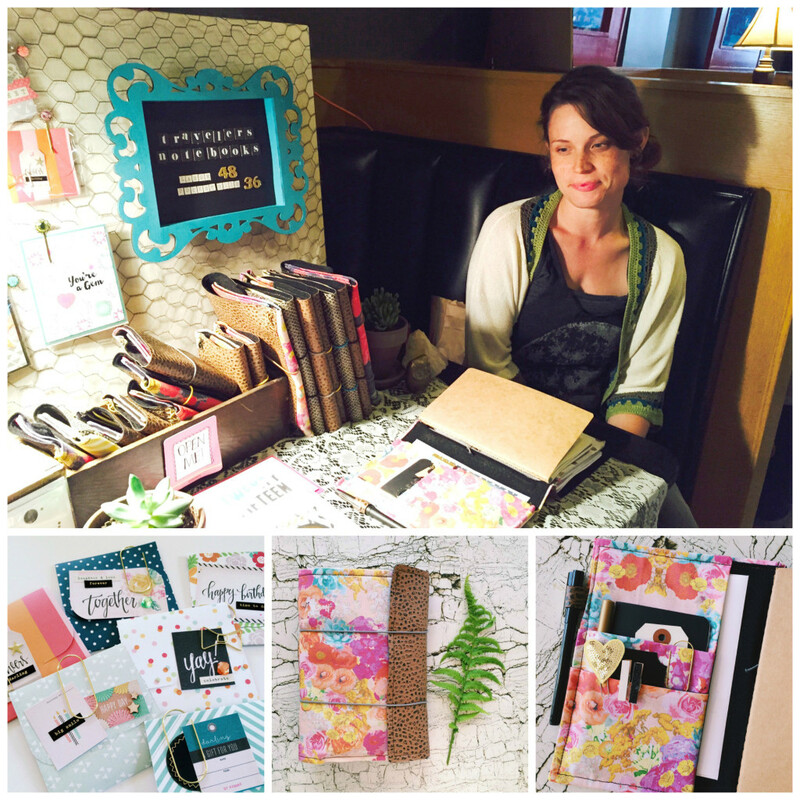 I flipped through the contents of one of her lovely fabric-covered planners, and discovered it holds up to five different and removable organizers, and features useful locations for business cards, notes, paper clips, a pen, and more. Sabrina also crafts lovely cards, no two of which are exactly alike, with matching envelopes. 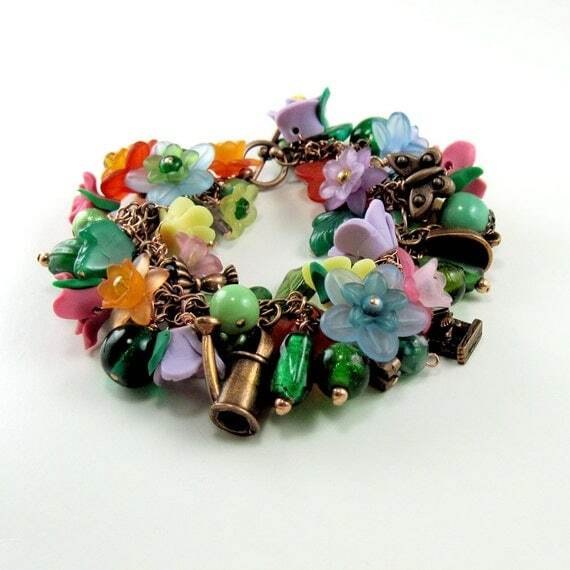 Besides her Web site, you can visit The Honor Roll on Facebook and her shop on Etsy. 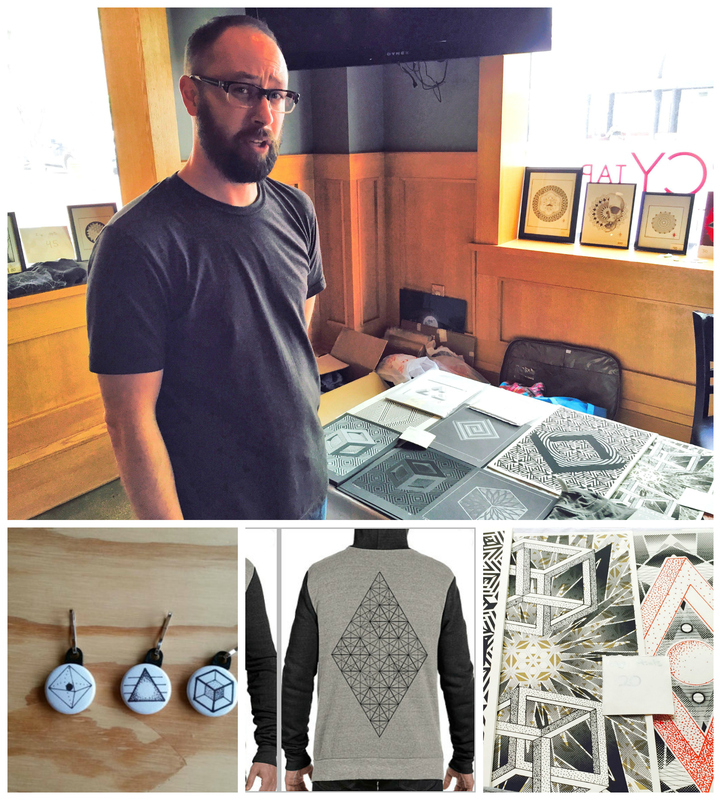 Jake Haselman of Jake Haselman on Etsy designs screen printed shirts, bags, buttons, zipper pulls, coasters and art prints. His black-and-white geometric art is distinctive, pulling you in for a detailed look at his work. Trust me—I couldn’t resist crouching down to almost stick my nose into one of the prints for a closer examination! 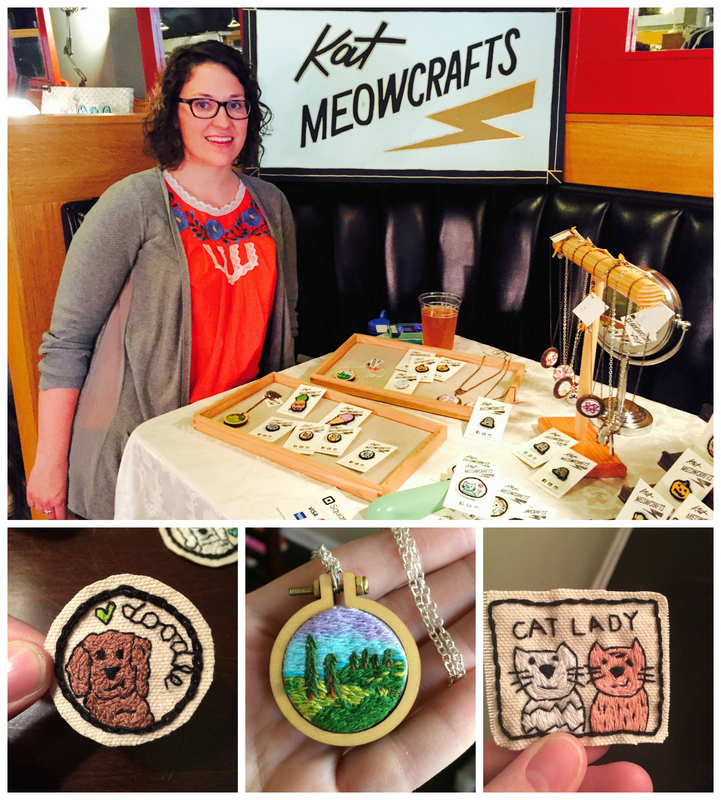 Kat Hutchison of Kat Meowcrafts works full-time during the daytime, but hand-embroiders buttons, pendants, patches and badges in her spare time. The tiny, detailed illustrations are her own. Kat says that while many of her designs feature cats, she actually owns two dogs. Cats are not in the picture because of her husband’s allergies. 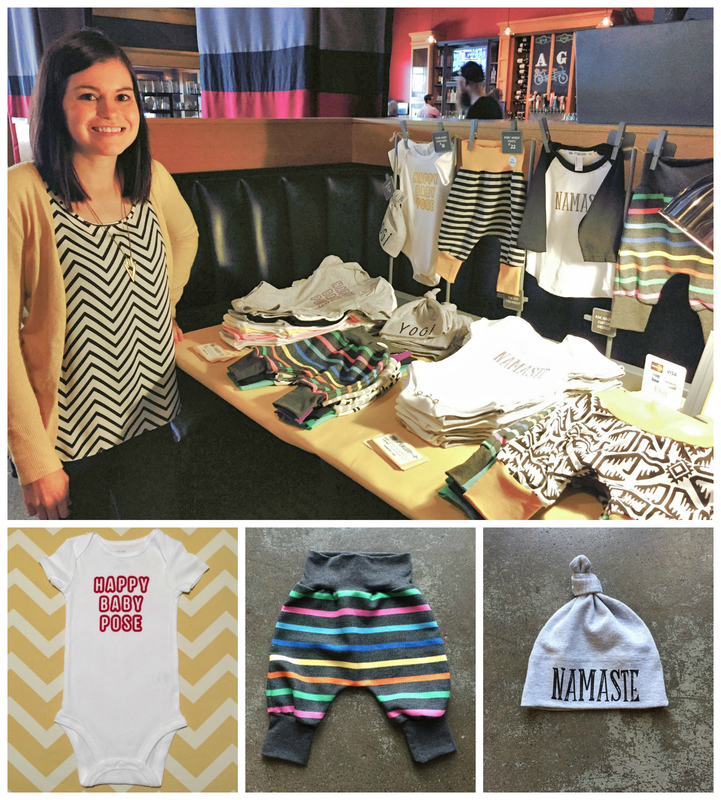 Jen of 11th & Mulberry sells adorable cotton baby clothing such as onesies, yoga hats and harem pants. What’s different about her clothing line is that she screen prints a design on each piece with water-based ink. For many of the garments, you can specify what color of ink you prefer. 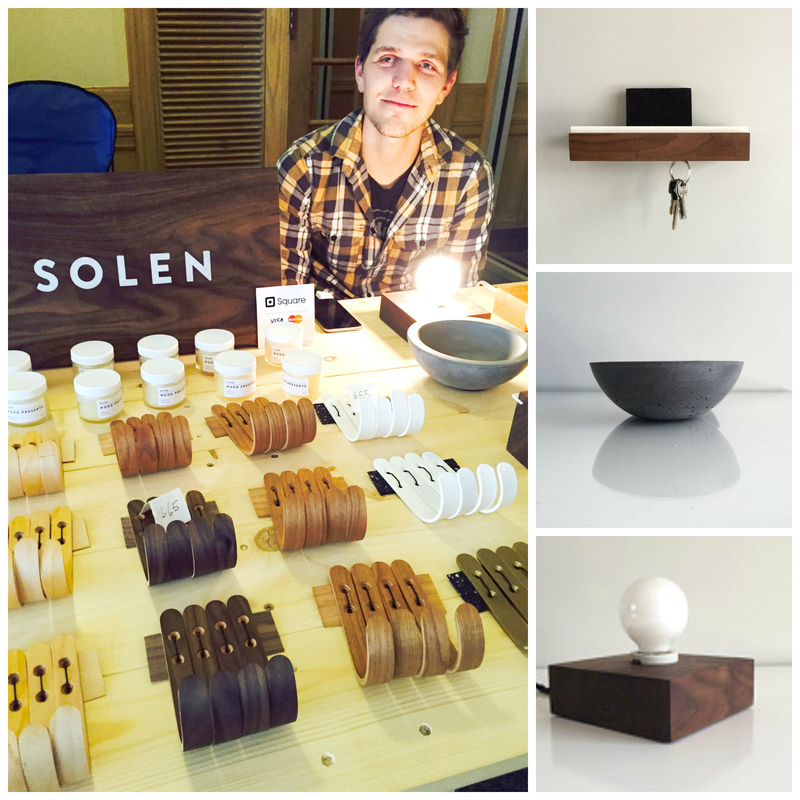 Shawn Solen of Solen Studios designs unique cement planters and bowls, table lights, wall hooks made from assorted woods, metal wall hooks, and a wall-mounted entryway oak shelf that holds your keys and your mail. Although you can visit his Etsy shop to purchase these items, a more complete gallery of his work appears in his Instagram feed HERE. I fell in love with ceramic artist Erin Carpenter’s beautiful white pottery, carved and painted with her delicate designs. I liked it so much, in fact, that I purchased one of her ring bowls, shown in the lower left photo below. 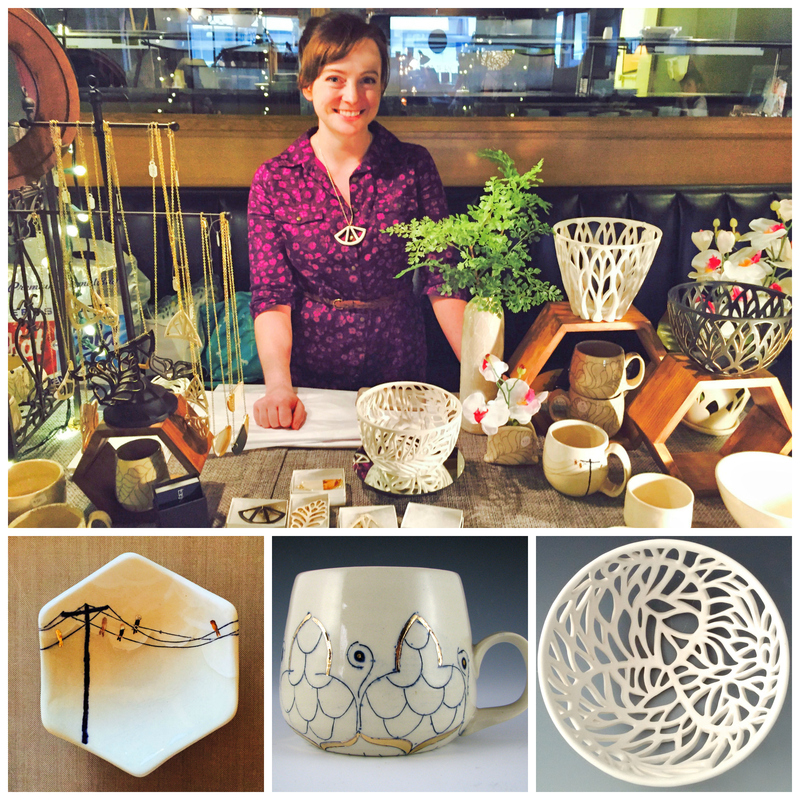 You can browse through Erin’s lacy bowls, stoneware, and painted white pieces at her Web site, Erin Carpenter Pottery, but you can purchase pieces of it in her Etsy shop, also called Erin Carpenter Pottery. 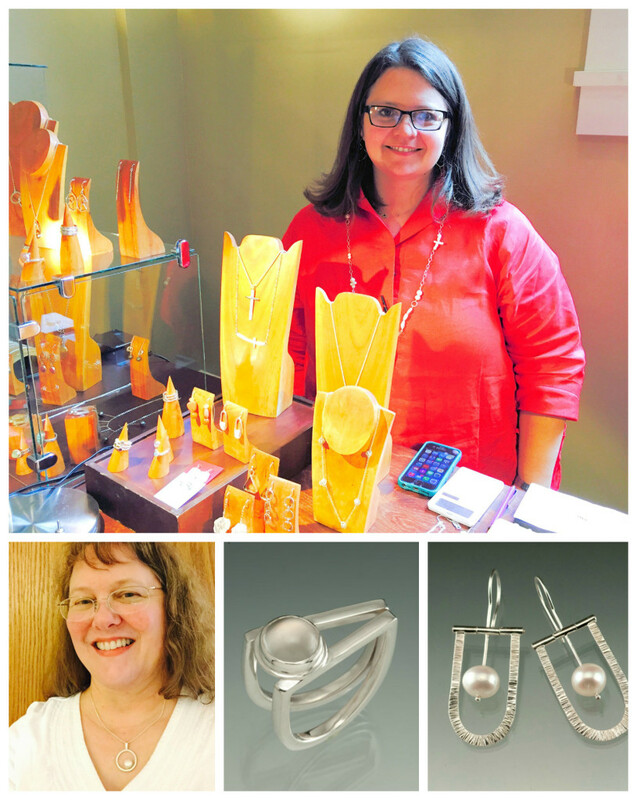 Just before Market Day closed today, John and I visited with Jen Lawler of JL Designs, a silver- and goldsmith who designs and crafts exquisite jewelry with clean, modern lines. 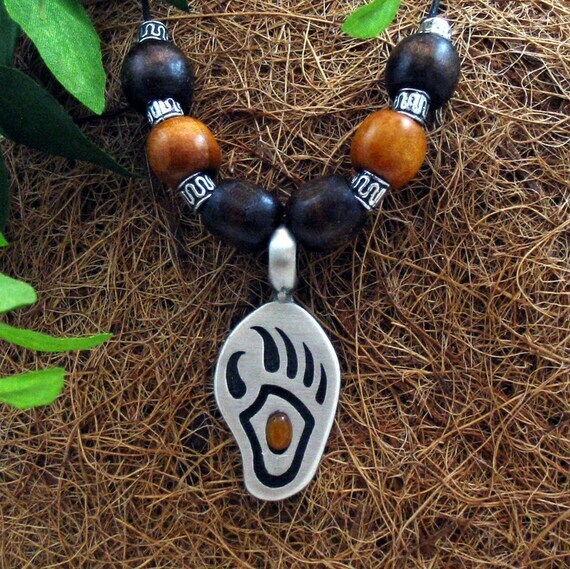 I have been looking for a long time for a necklace to match a sterling silver bracelet I purchased years ago at the Kentucky Artisan Center of Berea, and was excited to discover exactly what I needed. 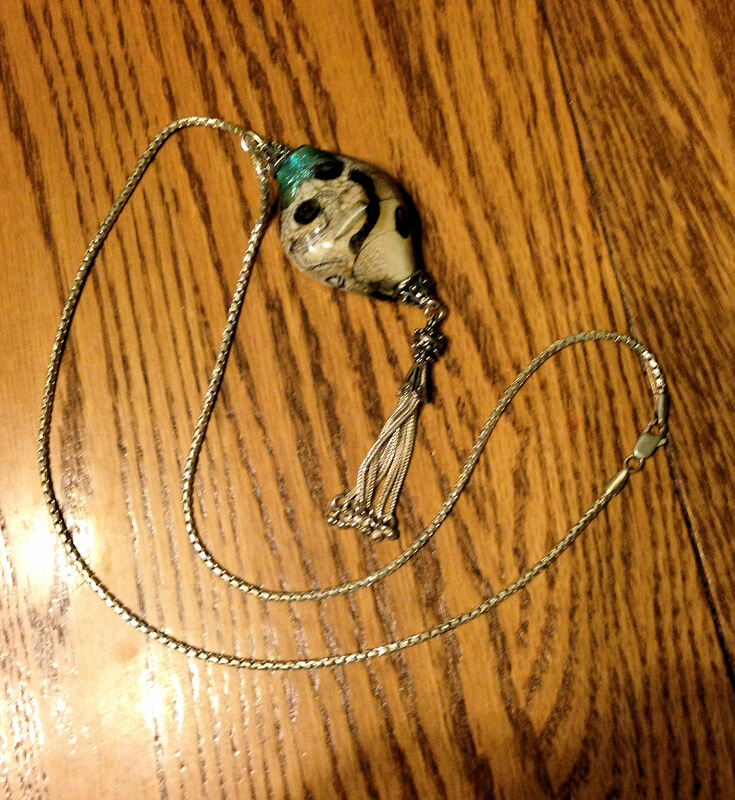 I’m wearing the necklace in the photo below, but you can also see some of Jen’s other pieces. 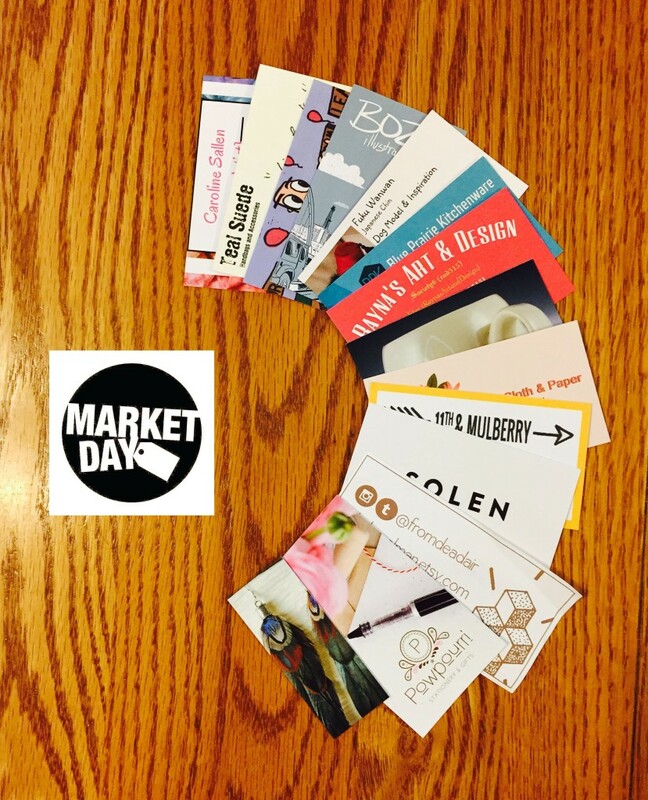 The artisans I have introduced in this post represent about a third of the ones selling at today’s Market Day in Des Moines. The event is small enough that you can take the time to chat with the designers and learn a little bit about their process, in addition to checking out their wares. This is the first time we have visited a Market Day event, and John and I thoroughly enjoyed ourselves. Have you attended a craft venue lately, where you shopped instead of being a vendor? What special finds did you discover? 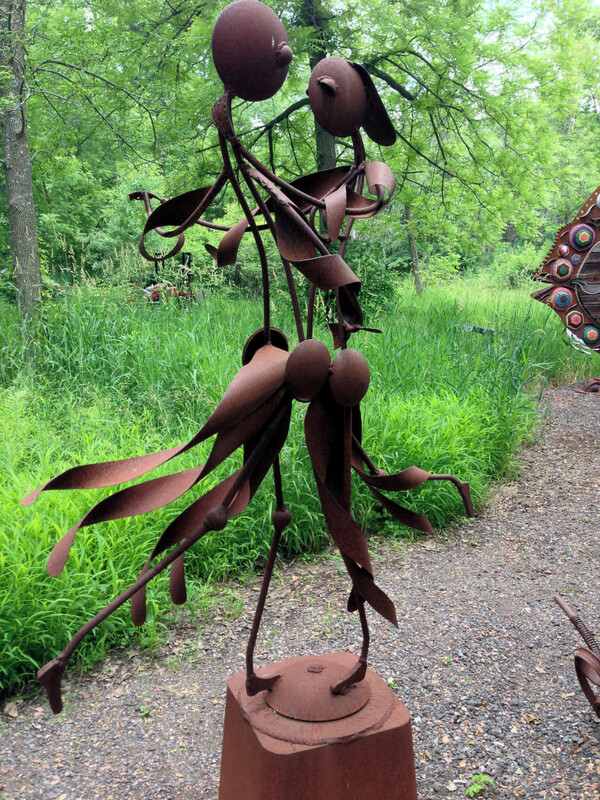 When John and I visited his mother last week in north central Wisconsin, we drove to Jurustic Park, four miles north of Marshfield, to visit a sculpture garden. 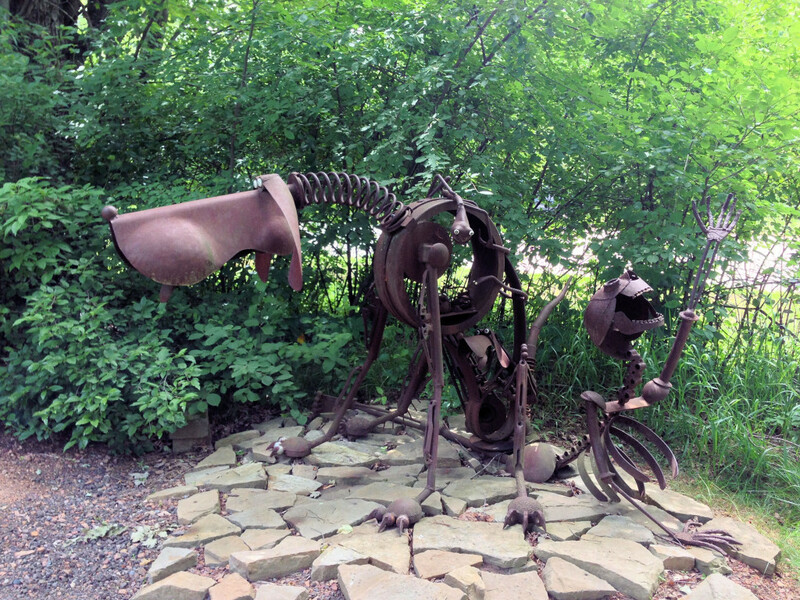 Jurustic Park is located on the grounds of a private residence where Clyde and Nancy Wynia ply their art every day, sharing their creations with anyone who visits them. 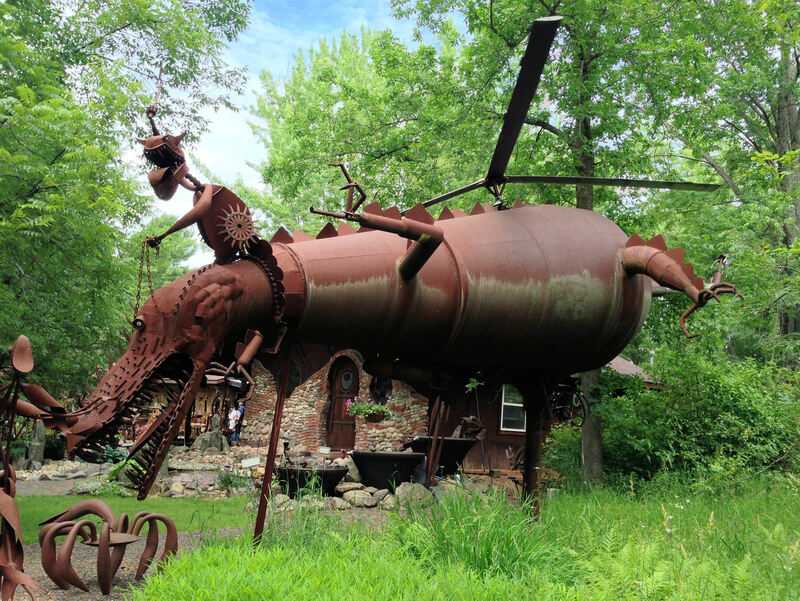 Next to their 1920s-style Victorian home on Sugarbush Lane sits a sculpture garden where the couple cleared out brush to create space for Clyde’s workshop and sculptures, as well as Nancy’s glass studio that in every way resembles a Hobbit House. 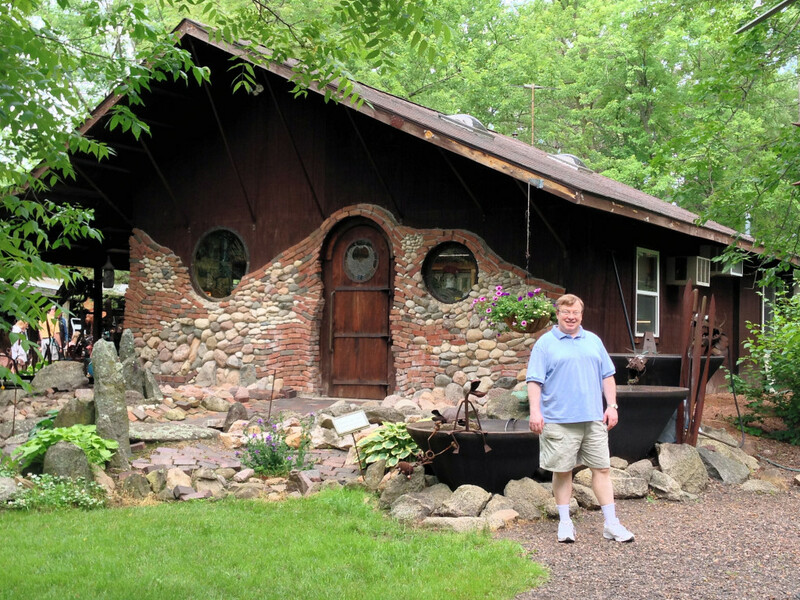 John stands in front of Nancy’s Hobbit House. Clyde is a 75-year-old metal sculptor who has dabbled in all kinds of crafts—pottery, stained glass, wood and photography—before discovering his preferred art, metal sculpture. 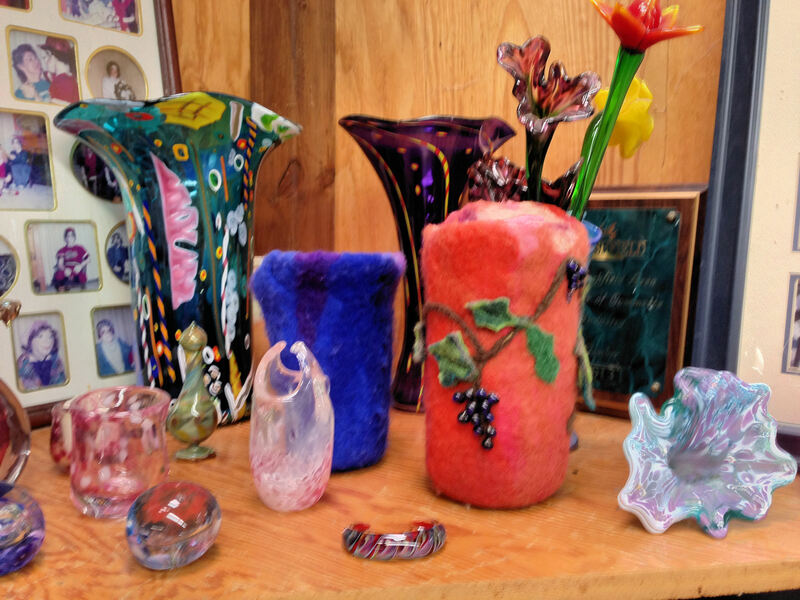 Nancy, on the other hand, is a glass, fiber and textile artist who crafts beautiful glass jewelry, ornaments and kaleidoscopes, in additional to felted wool sculptures and life-sized soft sculpture dolls that Clyde says are her relatives. Although he has been retired now for about 15 years, Clyde used to practice law in Marshfield, and his wife still volunteers her nursing skills locally. 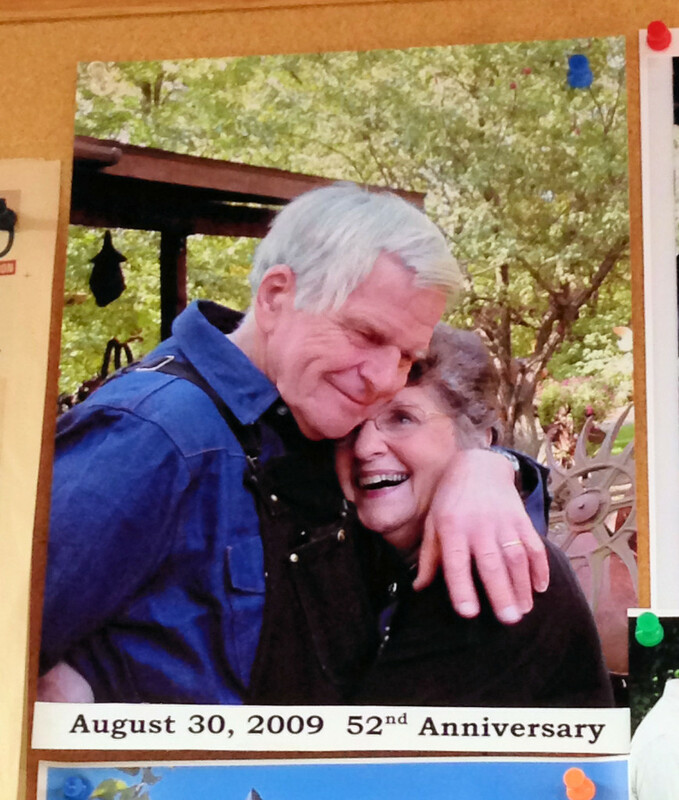 The fact that both of them live happy, creative lives is evident from their 52nd wedding anniversary photo, taken almost four years ago. The creatures were often harvested for their parts that were then used in farm and industrial machinery. Over-harvesting eventually led to extinction of many species. Other species became extinct when acid rain caused them to rust over. 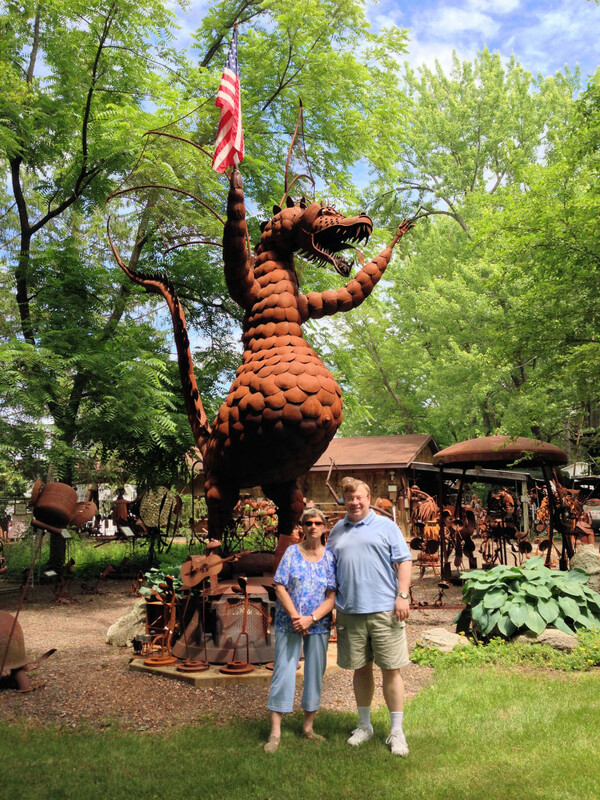 John and his mother stand in front of this patriotic dragon. 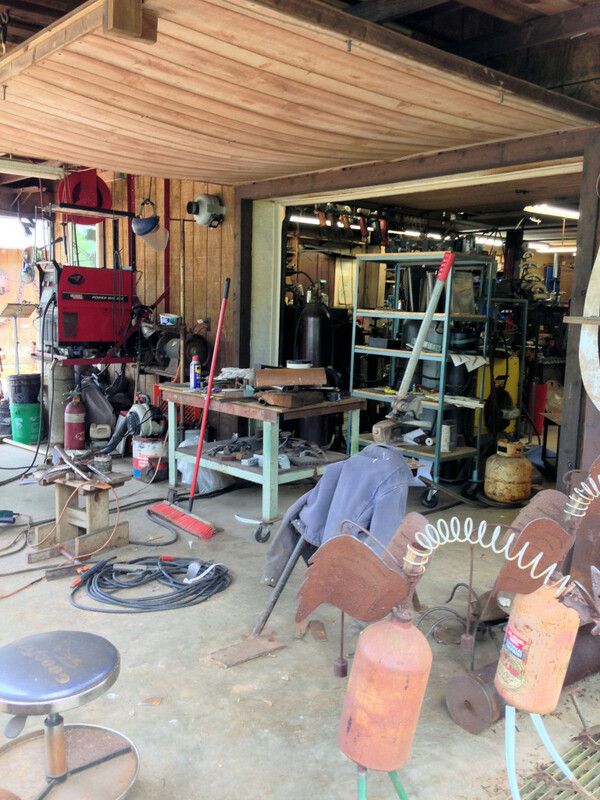 Both inside his workshop and stacked outside it are metal parts that Clyde says are the bones of creatures he has rescued from the local marsh. 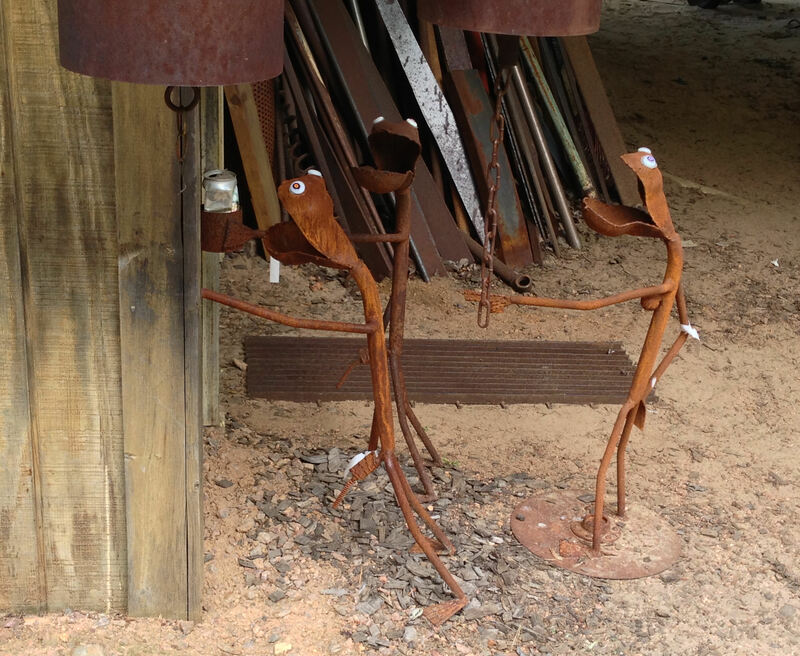 When visitors ask him where he gets his metal, he says, “Wherever I can find unattended, unattached metal. 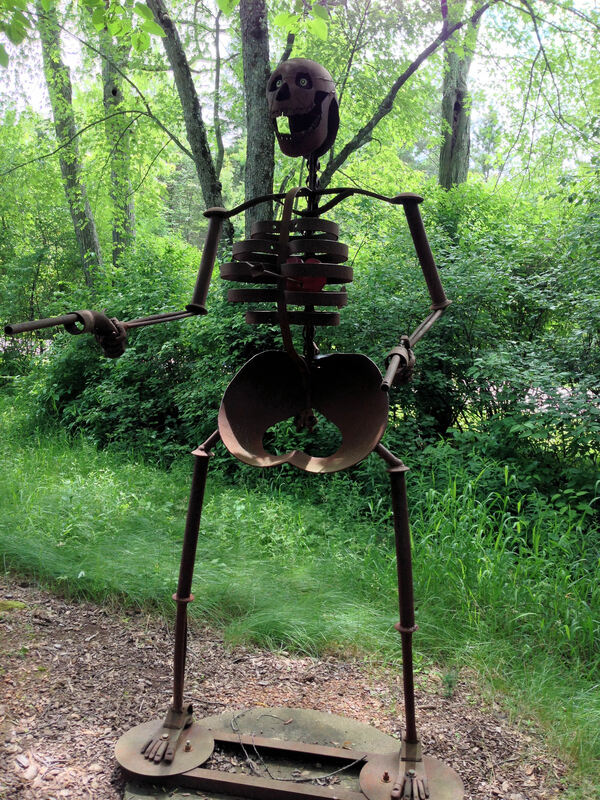 Lock your car.” He treats the metal with a mixture of salt vinegar and peroxide to give the sculptures their special rust patina. It takes years before this patina darkens, further enhancing Clyde’s tales about the creatures who lived millions of years ago in the MacMillan Marsh. I discovered this video on YouTube that does an excellent job at introducing you to Clyde and his creatures. 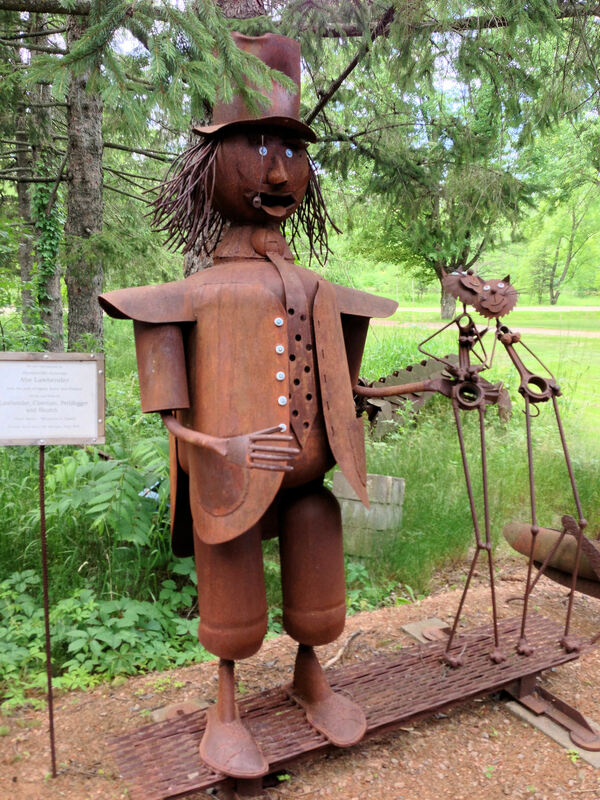 Above all, Clyde is a masterful storyteller and enthusiastic tour guide as he introduces many of the characters in his sculpture garden, infusing each anecdote with his special brand of humor. There are the frogs, for example, who haven’t figured out where the indoor plumbing is located. Behind them stands Clyde’s wife, scolding them with her finger. We are represented by Shysterville Attorney Abe Lawbender with his pair of legals, Katty and Feeline of the Law Firm of Lawbender, Cheetum, Pettifogger and Skumb. Their Motto: ‘Whatever it Takes.’ If your facts don’t fit, they will. 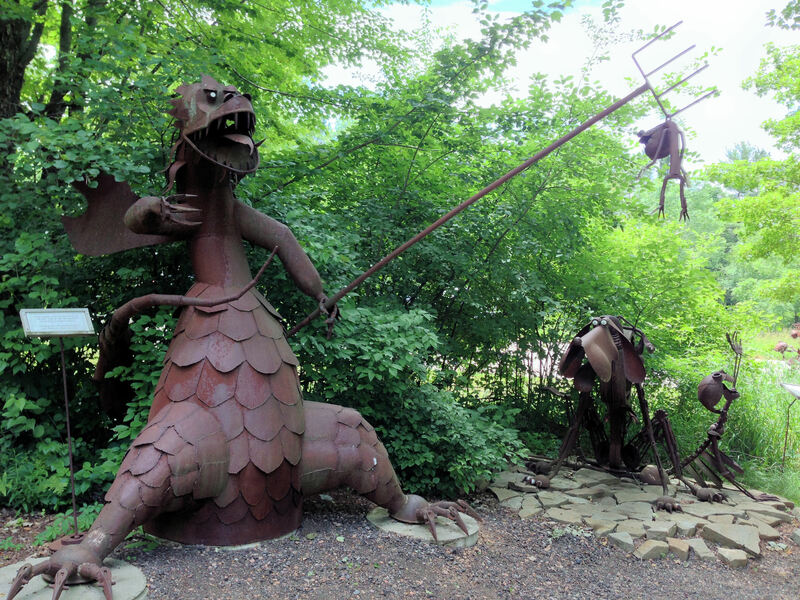 In front of the Hobbit House sits a dragon copter intended to replace or assist local ambulance efforts. Life May not be the Party you expected, But while you are here you may as well dance. Then again, if life is more than you expected, all the more reason to dance. Fast Eddy is one of the more popular characters in Jurustic Park. Who is Eddy? A sign explains. Eddy Biscotti was a Norwegian gunfighter (with an Irish accent) in the marsh in the 1800s. He was fast. Then in 1888 a stranger of unknown ethnicity rode into the marsh and challenged Eddy to a draw. They met in the critter coral at noon. They drew in unison, but Eddy, in the split of a second, was distracted by his challenger’s cleavage. His lust cost Eddy his life. He was shot in the heart and died instantly. Eddy’s descendants still claim that it was Eddy who won. They argue that Eddy was a well balanced man who still stands a century after his challenger was buried. 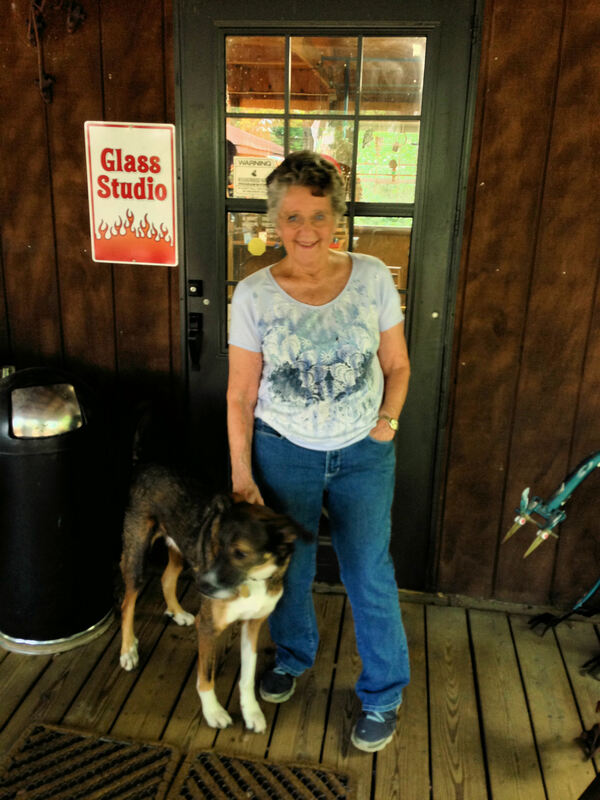 Speaking of dogs, when I visited Nancy in her glass studio, she was followed everywhere by the Wynias’ dog. Nancy explained that because they acquired him as a rescue animal, someone had already named him Clyde. She discovered, however, that this was a little confusing because both the dog and her husband came running when she called out their name. “We call him Joe now,” she said about their dog. 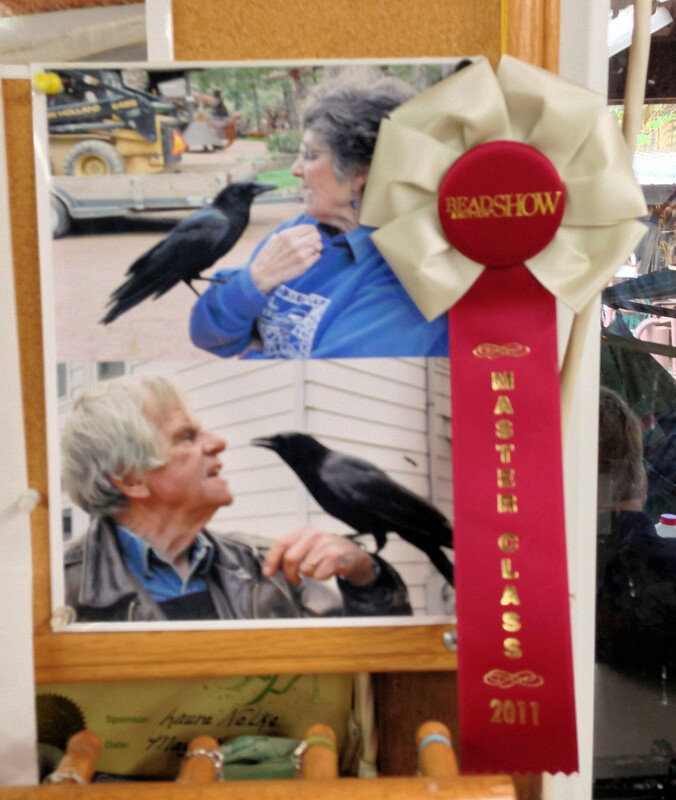 A photo inside the Hobbit House shows a crow sitting on Clyde’s wrist, with the same crow perched on Nancy’s forearm. I also noticed a child—I assume the Wynias’ grandchild—walking on the porch with a crow hitching a ride on the child’s wrist. “What’s the story about the tame crow?” I asked Nancy. She explained that I was looking at the second crow for which they had provided care. The first crow, Jerry, was a baby when he fell out of his nest, featherless. Clyde and Nancy took care of Jerry until he was able to be released, and the bird hung around for four years. The current crow is Eddy, short for Edgar Allan Crow. If I remember Nancy’s story accurately, someone brought Eddy to them because they heard that the Wynias knew how to care for birds. Eddy appears to be recovered from whatever his ordeal was about, and spends his time visiting sculptures and the people it recognizes, alighting on them at will. 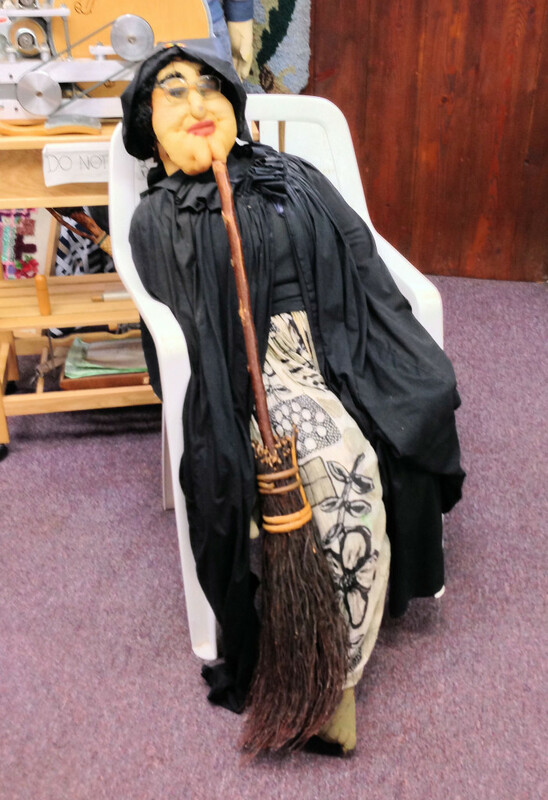 When my husband, his mother and I first entered the Hobbit House, Clyde pointed out her kaleidoscopes and life-sized soft sculptures, especially the one he says is his mother-in-law. 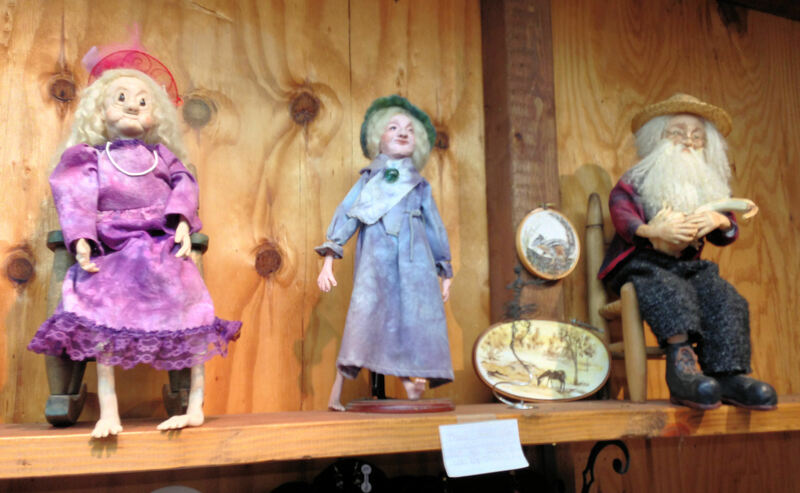 Nancy also designed the smaller soft sculpture dolls below, sitting on a shelf. Although both Clyde and Nancy do sell their art, many of the pieces in both Jurustic Park and the Hobbit House are permanent display pieces. 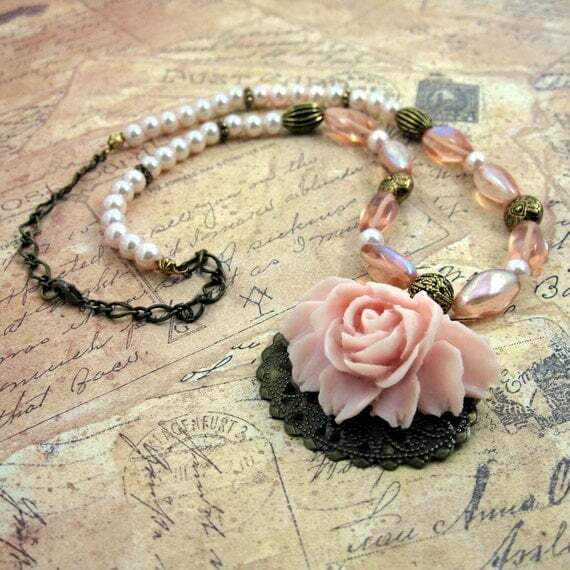 I fell in love with the necklace below. When you look at it closely, the textures in the pendant remind you of the beach, with sea creatures scattered in the sand. Nancy told me that it is actually silver inside the glass that gives it this appearance. 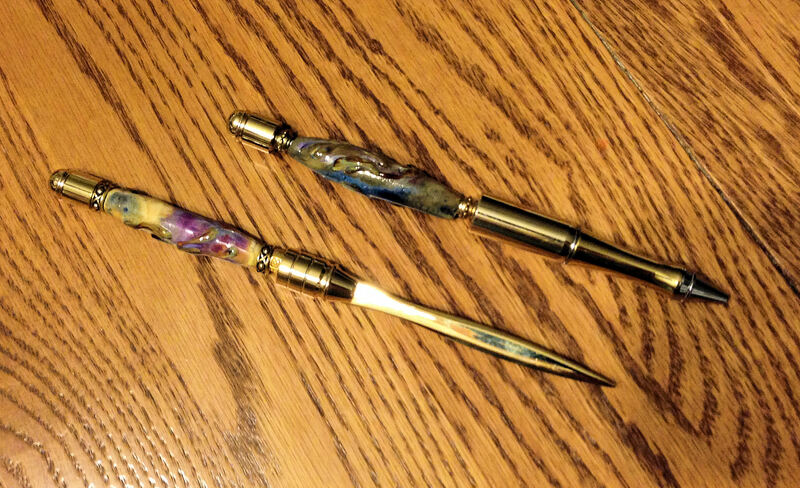 Besides the necklace, I purchased the lovely pen and letter opener set shown below. Wouldn’t you love to have one of these ornaments hanging from your Christmas tree, or in a window? Because I also work with fibers, I enjoyed looking at Nancy’s felted wool work. The red vase was created using a combination of wet felting and needle felting. 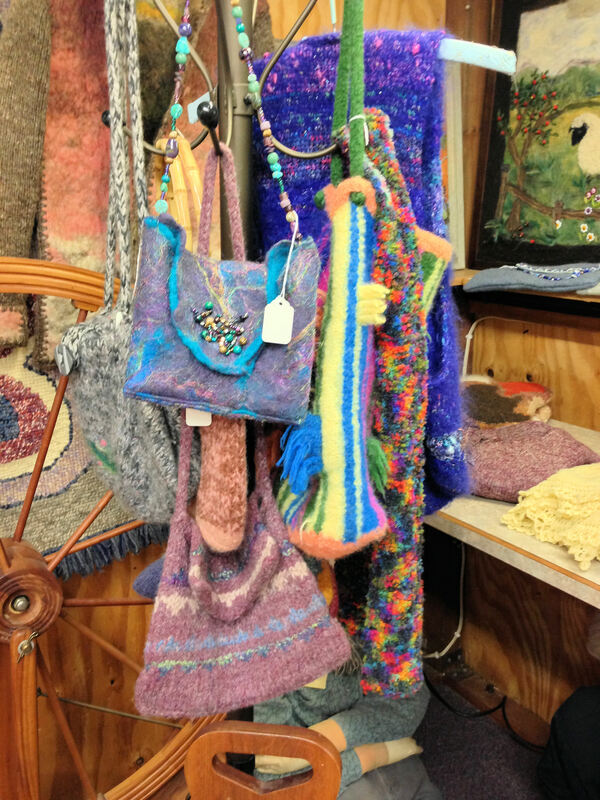 Nancy has a spectacular collection of felted wool bags she has created, too. None of the bags are alike. I was pleased to discover, when we drove into Marshfield after our visit to Jurustic Park, that Clyde’s work is appreciated locally. 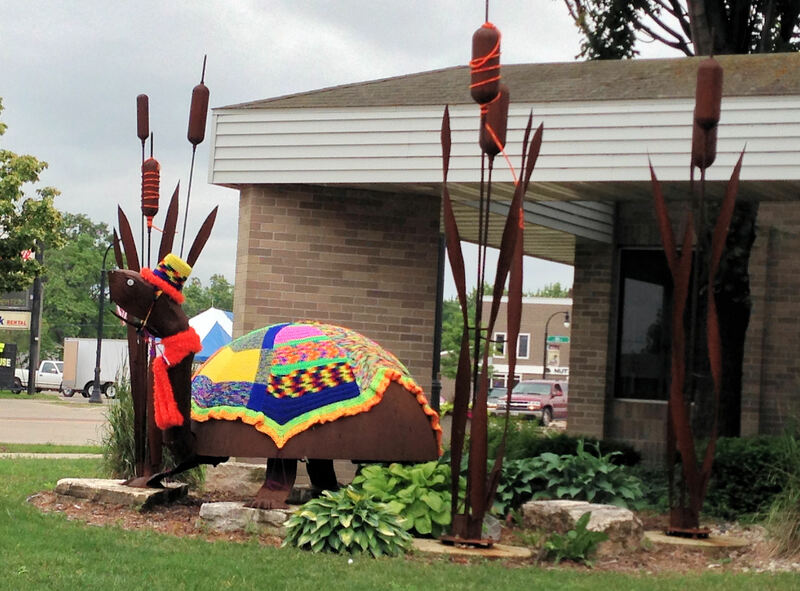 He has donated a good number of his sculptures, among them the turtle shown below. Amusingly, the sculpture has been yarn bombed, which somehow seems appropriate, given that Clyde does metal work and Nancy works with fibers. 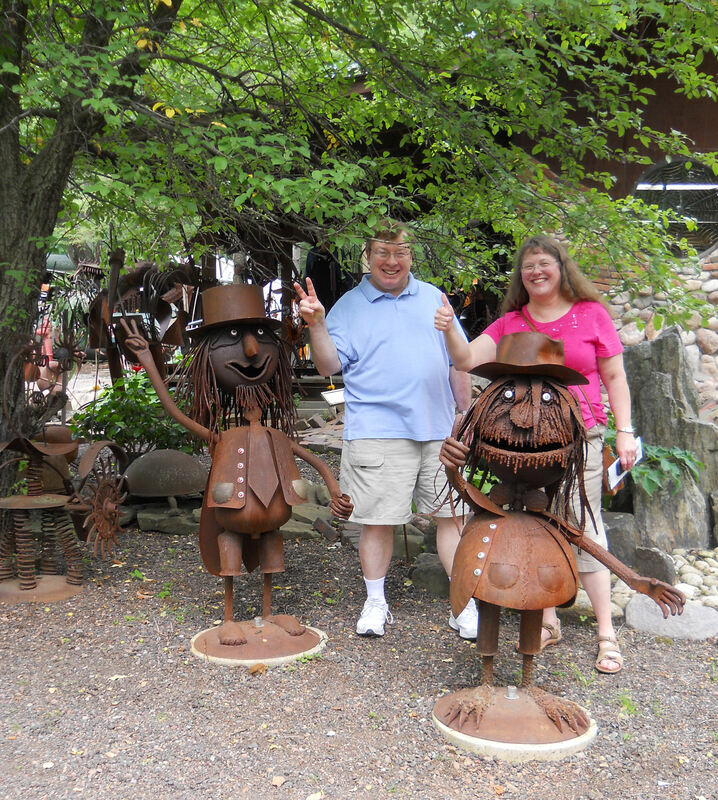 If you ever get a chance to visit north central Wisconsin, Jurustic Park and the Hobbit House should be on your list of places to visit. 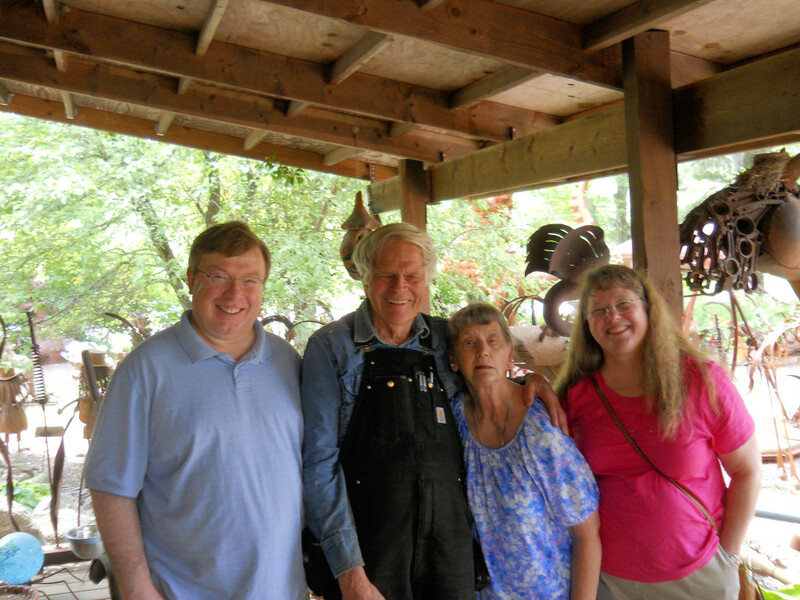 We thoroughly enjoyed the creativity, charm and hospitality of Clyde and Nancy Wynia. 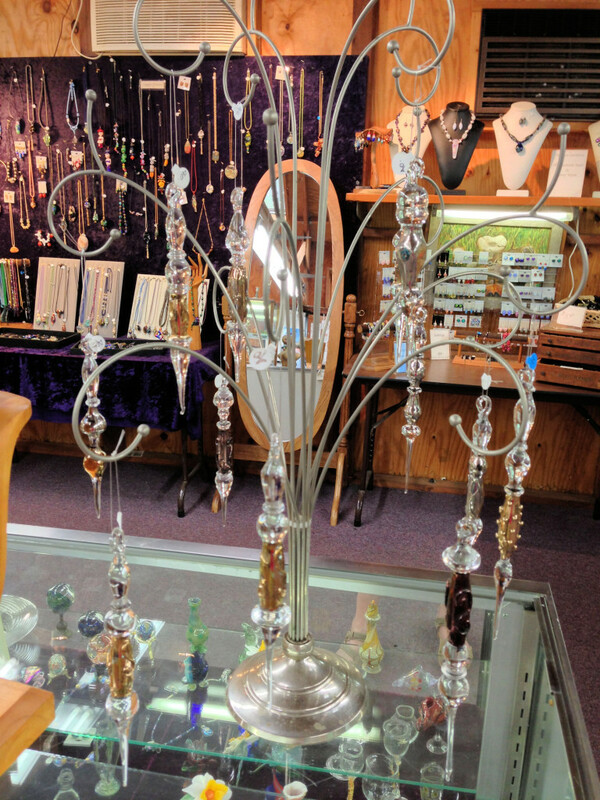 Karen’s work space reflects her wide-ranging interests and her love of natural stones, crystals, vintage-look metals, colorful beads and—in general—unique materials. 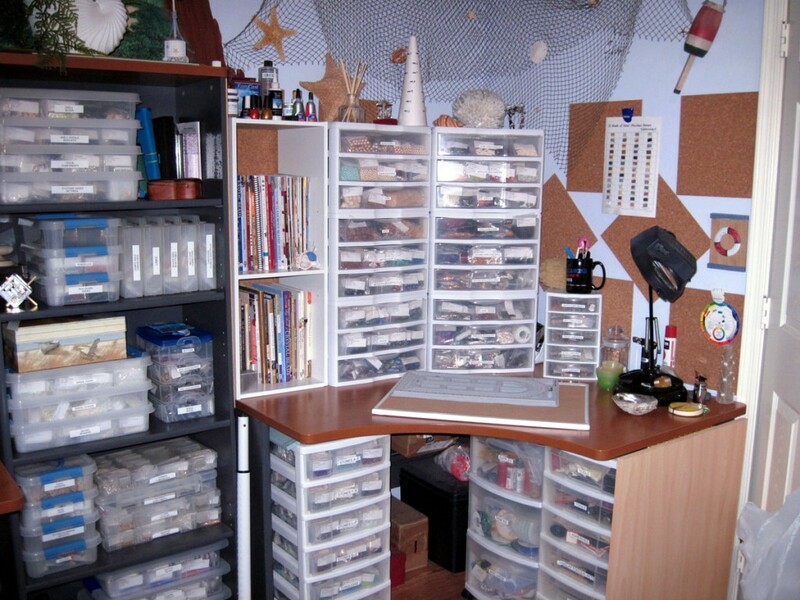 She stores her materials in plastic boxes with divided compartments, and has one of the most organized work spaces I have ever seen. Some of her overflow supplies can be found at The Crafters’ Cabinet on Etsy. Karen, who grew up on the south side of Chicago, now resides in Arizona, whose southwestern influence is evident in some of her designs, such as the one below. My favorite two items from her Mystic Wynd shop, however, are the necklace and bracelet shown below. To learn more about Karen, visit her blog. You can also read about her in the excellent interview posted on the EtsyBloggers blog.